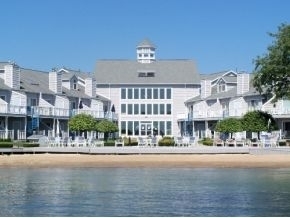 Culver Cove condo on Lake Maxinkuckee! The Cove is one of the most affordable ways to get on this highly sought after lake! This 3 bedroom condo offers a virtually maintenance-free lake lifestyle. Furnishings and appliances stay, so all you need are some personal items to start enjoying this home-away-from-home immediately. A light and airy great room features a gas fireplace and sliding door to your lakeside deck. Kitchen has a breakfast bar. Light wood-like floor in the living room, ceramic tile in the kitchen and baths, carpet in the bedrooms. A rarity for the Cove, this unit has 2 private bedrooms upstairs. Relax on your deck with stairs to the private beaches. Culver Cove amenities include: 2 private sandy beaches, tennis/basketball courts, indoor heated pool with whirlpool, fitness room, and more. This sound investment could pay for itself in rental income! Call to discuss the details! Bedroom measurements are estimated, buyer to measure for their satisfaction.